Oberon Zell is the founder of the Church of All Worlds (CAW), one of the most influential Neo-Pagan traditions. In 1962, Oberon (who then went by “Tim”) founded the Church of All Worlds in Missouri. The organization was modeled after the fictional “church” in Robert Heinlein’s novel, Stranger in a Strange Land. Its practices and beliefs included including polyamory, sacraments (“Never Thirst”; water-sharing), immanent divinity (“Thou art God”), and pantheism (“all that groks is God”). The group originally derived its ideas from Ayn Rand, as well as Heinlein, but later became more Neo-Pagan. In 1967, Oberon filed for incorporation of the Church of All Worlds as a “church”. Official status was granted in 1968, making it the first Neo-Pagan state-recognized “church”. The CAW eventually adopted Ed Fitch’s Pagan Way liturgy, which contributed to the conflation of Wicca and Neo-Paganism. Zell very consciously intended to create a new religion, in contrast to Wicca, which was considered by many at the time to be a “craft” or a magical system, not a religion. When Zell adopted the term “Neo-Pagan”, he intended it to stand in contrast to Christianity and monotheism. For Zell, “Neo-Pagan” came to mean earth religion or “green religion”. Zell is credited with coining the term “Neo-Pagan” for the newly emerging family of alternative religions. In 1968, the CAW began publishing the Green Egg newsletter, which became the most important Neo-Pagan forum for many years, and was instrumental in the formation of a emerging identity around the name “Neo-Pagan” (later “Pagan”). 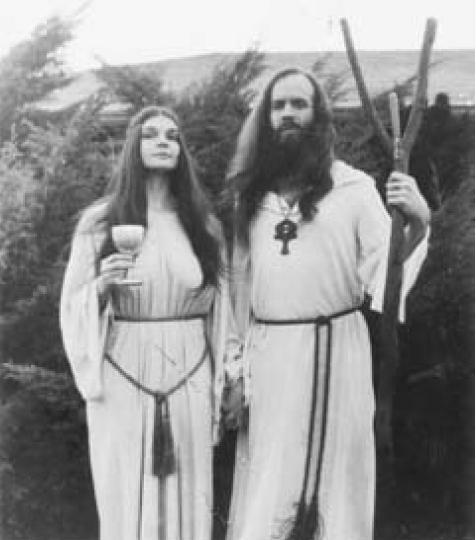 In 1972, Zell and his partner, Julie Carter, took a tour of Californian Neo-Pagan groups, meeting Ed Fitch, Fred and Svetlana Adams, Isaac Bonewits, Aidan Kelly, Victor and Cora Anderson, and other leaders in the emerging Neo-Pagan community. The trip was key in connecting these various Pagan groups. Zell and the Church of All Worlds subsequently played a prominent role in efforts to create a Pagan ecumenical organization, including the Council of Themis in 1972, the Council of Earth Religions in 1973, and the First Ecumenical Pagan Council in 1974, although ultimately these efforts failed. Zell met Morning Glory in 1973, and the two were married in a public Pagan handfasting in Minneapolis in 1973. Isaac Bonewits and Carolyn Clark officiated and Margot Adler sang Gwydion Pendderwen’s songs.